A few years ago I attended New York's famed LaGuardia High School for Music and Art and Performing Arts. I was one of 60 students accepted into the highly-competitive drama program and little did I know I'd meet and become besties with a woman whom many regard as today's current rap she-ro. Throughout the years I've known her, Nicki Minaj has remained a dynamic personality whose diligence and belief in herself has been unwavering. I've watched her grind and hustle her way to where she is now, and her story is a true testament to someone who went from nothing to something. I sat down and interviewed my friend to find out how she deals with the good, the bad and the ugly of her new-found success. A few years ago I attended New York’s famed LaGuardia High School for Music and Art and Performing Arts. I was one of 60 students accepted into the highly-competitive drama program and little did I know I’d meet and become besties with a woman whom many regard as today’s current rap she-ro. Throughout the years I’ve known her, Nicki Minaj has remained a dynamic personality whose diligence and belief in herself has been unwavering. I’ve watched her grind and hustle her way to where she is now, and her story is a true testament to someone who went from nothing to something. I sat down and interviewed my friend to find out how she deals with the good, the bad and the ugly of her new-found success. THEMBI BANKS: This past year has been life-changing for you. What moment or event stands out as the most? NICKI MINAJ: Performing with Jay-Z and Kanye, going to Trinidad, and the documentary I did on MTV were all definitely the most memorable moments. A lot of people had really great things to say about it. BANKS: Your debut album “Pink Friday” came in at number two on the Billboard 200 charts and is the biggest debut for a female rapper since Missy Elliot in 1998. MINAJ: Actually Lauryn Hill was in ’98 — not sure how many copies she sold and Missy was in ’06, when she sold 260,000 copies. BANKS: Many would say your rhymes are a far cry from those of Lauryn Hill or Queen Latifah. Quite honestly your approach to music can also be perceived as very different from Lil’ Kim and Foxy Brown. What do you say to those hip-hop fans who want you to be everything to everyone? MINAJ: [laughs] I would just smile and nod and say that I’m human and I can only be who I am. I’m changing the game in so many ways but it’s so easy for people to compare you to other females in the game. We all bring something so different and you have to just respect that. BANKS: Who are the people that have been most influential in helping you grow as an artist? MINAJ: Definitely Wayne, Kanye, Drake and Trina are the people I can go to the most for advice and support. BANKS: Let’s go back a bit; your mother is a big part of your life. Tell us how your relationship with her has shaped you as a woman. MINAJ: She showed me that you have to be strong and always have faith in God, she taught me that where there’s a will there’s a way, and that stays with me. Where there’s a will, there is a way. BANKS: Many people don’t know that you grew up in the church and have remained a very spiritual and faith-based person. When you wake up or go to bed at night — what do you pray for? MINAJ: I pray for wisdom, protection, and I pray for success. BANKS: You have such an intimate relationship with your fans — teenage girls around the globe adore you. What do you want young women to take away from your music and messages? MINAJ: [laughs] My fans are so spoiled, I spoil them and try to make sure they feel close to me. I want them to know they can be strong, do whatever they put their minds to. I want them to know it’s okay to just be yourself and love who you are. I tell them that it’s important to keep their asses in school, education is the key! BANKS: Tell us about your Barbies and how you came to this characterization for your fans. MINAJ: [laughs] Well, I was in love with the Harajuku Barbie culture, and would always call myself that, so my fans started calling me Barbie. And, because I spoil my fans, I began to call them Barbz. It was like a term of endearment. And my gay boys, they wanted a name so I started calling them Ken Barbies, and for my straight guys I call them Stud Muffins. Beyond the Barbie image, tough bravado, silly characters and voices stands a genuine and sincere person. She’s always been someone people go to for the truth and her loyalty as a friend, and now an artist, has revealed itself in so many ways to fans across the globe as they latch onto her energy and charisma. BANKS: What is the most profound or special thing a fan has told you? MINAJ: They DM (Direct Message) me on Twitter and tell me that my songs give them strength. They tell me that they’ve been in abusive households, they’ve been raped, they’ve been abandoned, gone through things, and that one song in particular “Autobiography” — which was on my second mix tape — they tell me that that song made them believe that you can get through anything. Girls that connect with me have deep stories and a lot of pain that they’ve experienced. BANKS: When you look at the blogs and social networking sites Black women seem to be some of your harshest critics. MINAJ: They are. Black women are definitely my harshest critics. I can’t speculate as to why they are but it’s definitely true that Black women have the biggest issues with me but Black girls… they are who created Nicki Minaj. Black girls, the younger females they are so much more free-spirited, they’ve embraced me, the Black girls are the ones that are fun and appreciate me. I think Black women just tend be so much more judgmental. I’ve always known Nicki to use people’s adverse opinions of her as fuel to go harder, be better and stay focused on the goal. There have been many setbacks, trials and challenges that tested her endurance. But one very important thing we learned in high school is to have a thick skin and a steadfast belief in your gift. BANKS: Recently, we’ve all been overwhelmed with powerful images of Black women, from the movie, “For Colored Girls” to BET’s “Black Girls Rock Awards.” With your success and visibility, what do you want to show the world about who you are as a Black woman? MINAJ: I want to show them that as a Black woman I’m whoever I want to be. I’m strong, I’m determined, a force to be reckoned with and at the end of the day I’m still an emcee. BANKS: Your colorful wigs, over-the-top ensembles and risk-taking style are often the focal point of many debates and conversations about you. How would you describe your approach to fashion? MINAJ: Basically, my approach is do whatever the heck you want. Being fearless, speaking her mind, having passionate points of view and establishing herself as someone to be respected has always been a part of her DNA. It’s amazing to see those qualities manifest in her professional life. She makes no apologies for demanding only the best and taking absolutely no shorts…from anyone. BANKS: What is the one thing you think people would be surprised to find out about you? I always tell people you’re much more conservative than they think. I’m probably more like Nicki Minaj than you are! MINAJ: [laughs] Yes that’s what I would say. I’ve never been a party girl, I’ve never been someone that’s like “where’s the party at.” I’m the one who goes to bed early. BANKS: What’s next for Nicki Minaj? Will you be touring, working on any new projects? 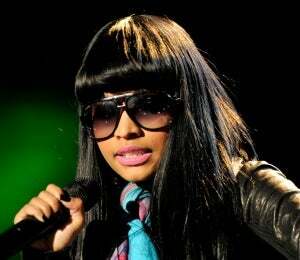 MINAJ: Yes, in March, maybe before, I’ll start touring London, the UK, Europe, Canada, Tokyo and also a U.S. tour. I’ll also be working on two acting projects around mid-next year. I’m going to be shooting videos for “Save Me,” “Moment for Life,” “Fly” with Rihanna and “Dominoes” which is the song that has all the celebrity mentions. It has been incredible to witness someone I love grow and blossom into a figure that, at times, seems larger than life. From the first day I met her in drama class, Nicki inspired me to be fearless and her motivation continues to leave me in awe as she takes the world by storm. What I’d like people to know most about her is that behind the lights, camera and glamour there lies a real person, an amazing talent, a budding mogul and a woman that took a step out on faith and never looked back. Now Roger that! What do you think of Nicki Minaj?